I have been sent a few emails in the past few weeks, and asked on air many times about what antennas I use whilst I am out portable. So here is a short blog about what I use out in the field. 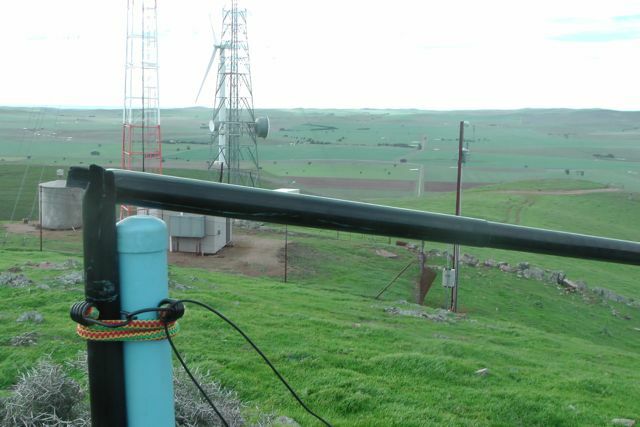 The very first antenna I used on a SOTA activation was a Chinese version of the Buddistick, called the PMSA-12, which has a multi band loading coil. The antenna comes in a nice fabric bag and its total weight is just 1.4 kg. The antenna is rated for maximum power of 100 watts and its total set up length is 410 cm. I purchased this antenna via ebay. I had heard about this vertical antenna from Marshall VK3MRG who had used it, and continues to use it, with success. The first time I used this antenna was whilst I was operating portable on VK5/ SE-016 on the Fleurieu Peninsula of South Australia in March 2013. This was an un-announced activation and my first ever SOTA activation. In fact it was my first ever portable activation. 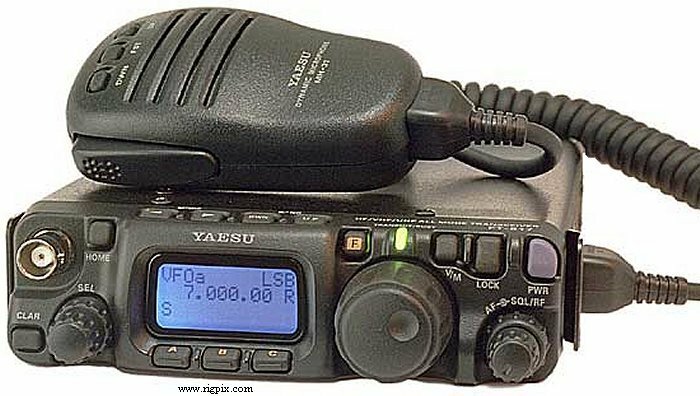 I managed to get 7 contacts whilst running the Yaesu FT-817nd and QRP 5 watts. Signal reports were okay into the eastern states. Although the antenna was quick to deploy, I found that the ground radials were a bit of an annoyance and impacted heavily on the VSWR. I had to use my Rig Expert antenna analyser to get things just right. So for me it was not the perfect portable antenna which allowed me to get on air quickly. On my second SOTA operation, this time from Mount Lofty summit, VK5/ SE-005, in March 2013, I again used the vertical. The vertical performed well, with 14 contacts including 2 QSOs into Western Australia, 1 into Queensland, 1 into Tasmania, and the remaining were in VK5. Considering I was running QRP, just 5 watts, the signal reports were very good. But again, getting the radials just right was an annoyance. 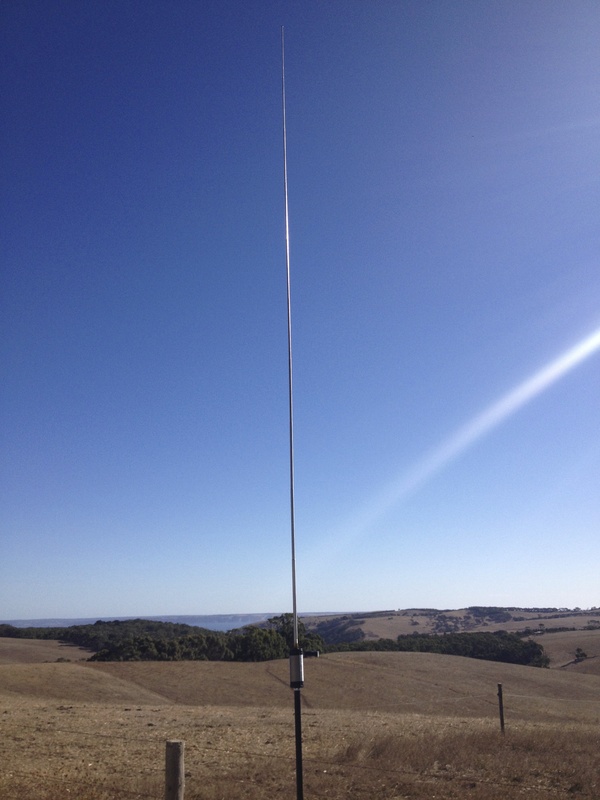 On my third SOTA activation at Mount Gawler, VK5/ SE-013, in April 2013, I again used the vertical. But half way through the activation, I changed over to a linked dipole which I had purchased a week or two earlier, from SOTABeams in the UK. The antenna is called a Band Hopper II which is designed for use on 40 metres and 20 metres. It is power rated for 125 watts. Although I have never run anywhere near that amount of power through the antenna. The linked dipole was supported by a 7 metre heavy duty squid pole and in an inverted vee configuration. The signal reports I received back from the eastern states, were no comparison to the vertical. They were much better. I have never looked back since. So, what is a linked dipole? A linked dipole is a very good portable antenna that gives you a very efficient dipole on certain bands. 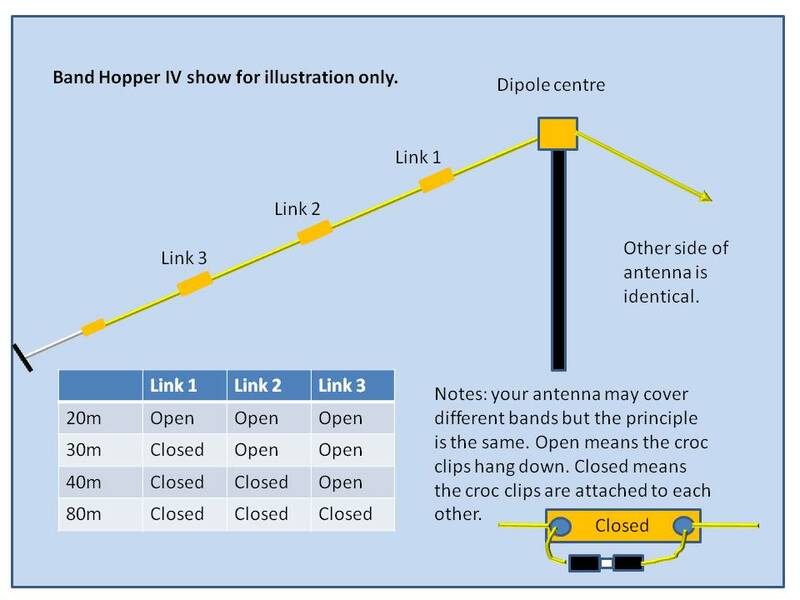 To select/change bands, you simply need to connect or disconnect sections of the dipole, depending on what band you are operating on. 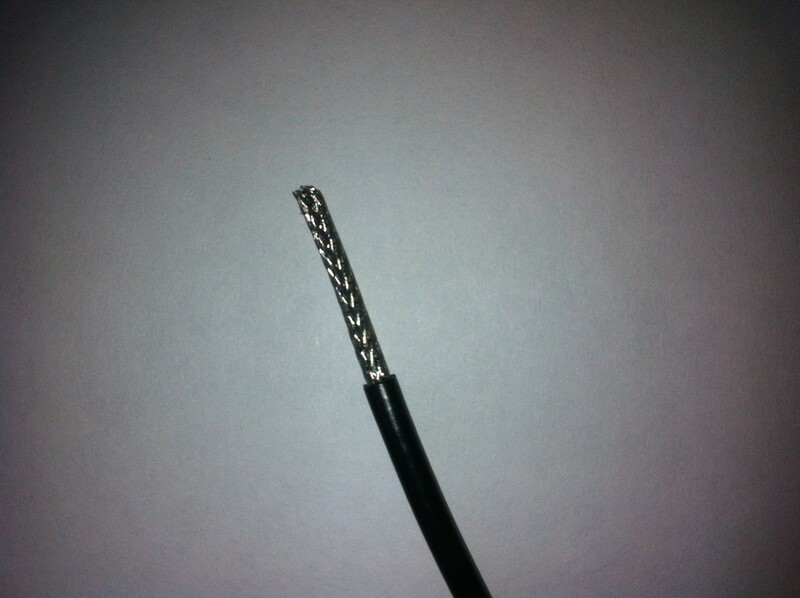 This lengthens or shortens the antenna to make it resonant on a particular band. I have never used a tuner with this antenna. The coax simply plugs straight into the transceiver. I have found the VSWR to be about 1.1:1 across the SSB portion of both the 40m and 20m bands. It is lightweight and has a total weight of 450 grams. The SOTABeams Band Hopper antenna uses RG174 coax and comes with a 10 metre feeder. RG174 is very thin and needs to be treated with a degree of care. However I have found it to be very good and because it is light weight it does not place any strain on the squid pole. Personally, I’ve found RG58 to be okay if you are park portable. But some of the summits I have activated from have been incredibly windy and the RG58 has placed just that extra bit of strain on the squid pole. To prevent the coax from flapping around in the wind I always use a piece of velcroe strapping to secure the coax to the squid pole. The SOTABeams antenna comes preterminated in a BNC plug, which is handy for use with the Yaesu FT-817nd which comes with a front BNC connector or a rear UHF SO-239 connector. If not simply use an adaptor plug. The ends of the antenna each have sufficient lengths of rope with plastic wire winders. The ropes are nylon braided and are 4 metres (13 feet) in length each. The ends can be tied off to nearby trees, pegged to the ground, or you can use rocks to weight down the wire winders. packs up easily – no parts to loose. What squid pole do I use? I use the 7 metre heavy duty squid poles that can be purchased from Haverfords in Sydney. The Haverfords squid poles come with a rubber knob on the top. However these can be removed if desired. These squid poles are very strong. I have only snapped one, and that was whilst I was activating Hallet Hill VK5/ SE-003, with Ian VK5CZ. The wind was well and truly above 60 kph on the top of that summit and the squid pole snapped at the weakest point where I had attached it to the trig point. How do you secure the antenna to the squid pole? 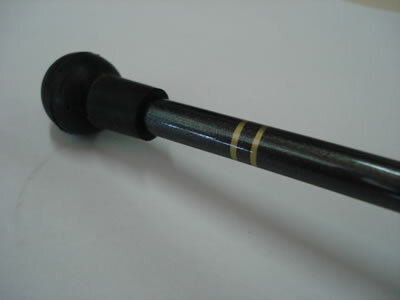 There are a variety of different methods of attaching the antenna to the top of the squid pole. I use a piece of velcroe string which is tied to the top of the squid pole and inserts through a hole in the perspex centre piece. Ian VK5CZ uses a wall plug with a hook inserted into the wall plug, which neatly slides into the top of the squid pole (with the knob removed). Which direction to I erect the antenna? I normally don’t get too flustered about what orientation the antenna is in. At this height, the antenna is pretty much omni directional. As a club, we at the Adelaide Hills Amateur Radio Club (AHARS) are planning a construction day, when a group of us can construct some linked dipoles, and then try them out in a park or on a summit the following day. Want some more information on linked dipoles? 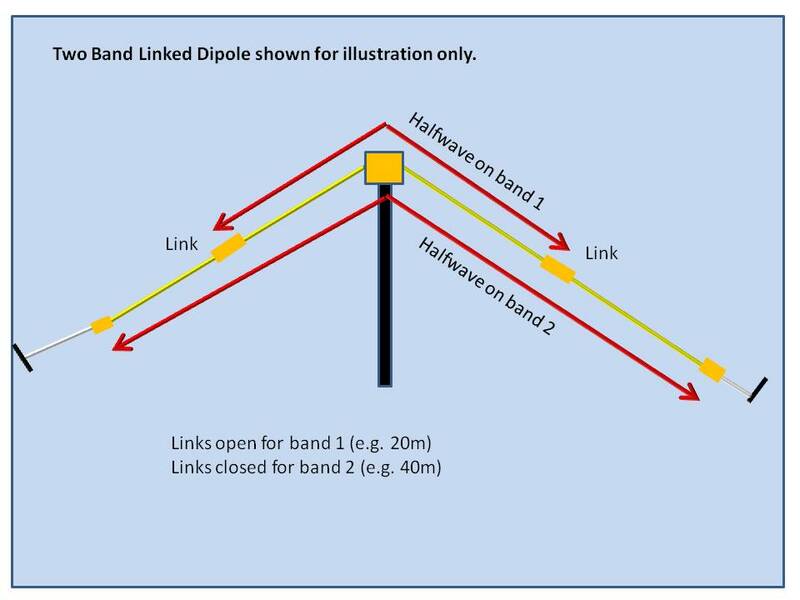 Here is a link to Peter VK3ZPF’s blog re his linked dipole…..
And Andy VK5LA’s WordPress site about his home brew linked dipole…..
And here is John VK5BJE’s blog….. If you google linked dipole, there are hundreds of sites that should provide you a lot of information on these very good performing antennas. Another great blog. As I understand it the Chinese antenna is no longer available. I think as a result of legal action – although I did check a while back. I purchased mine on ebay, but there was a lot of discussion on the Buddipole Users Group back in 2013, and their sale was subsequently withdrawn on ebay. I do have a Buddipole original as well, but haven’t used it in a long time. The dipole works so well that I haven’t gone back to the Buddipole. I must try them all out one day from the top of nearby Mount Barker and see which antenna wins out. The Haveford link needs to be updated to https://www.haverford.com.au/products/recreational-fishing-products/telescopic-squid-poles/product/517-7m-telescopic-poles-multi-purpose.